Thanks to the kind offices of the folks at the Field Museum, especially Fossil Vertebrates collection manager Bill Simpson, on Wednesday I got to hop the fence and spend some quality time with FMNH PR 2209, the mounted holotype specimen of Rapetosaurus krausei. I took a tape measure with me, to get some dimensions from the mounted skeleton. Of course I have the detailed descriptive paper (Curry-Rogers 2009), but mounted skeletons are three-dimensional objects and it is often surprisingly difficult to get a sense of a how a skeleton goes together in three dimensions from pictures and measurements of the individual elements. And if these dimensions are not precisely those of the animal in life, because of assumptions made during mounting–concerning, say, cartilage thickness between bones, or the angles of the ribs–at least they’re a starting point for understanding the whole-body proportions of Rapetosaurus. This is valuable because AFAIK this specimen is the only mounted titanosaur in North America, and maybe the only one outside of South America and China. [UPDATE: Alert commenters pointed out that I forgot about the Opisthocoelicaudia in Warsaw, which is almost entirely real, and the Argentinosaurus in Georgia, which is almost entirely fake.] And because Rapetosaurus is far out, man. ALL of the neural arches are unfused, even in the distal caudals–even the Arundel Astrodon (formerly Pleurocoelus) material has fused arches in the distal caudals (Wedel et al. 2000: fig. 15). So it’s a very young juvenile, but the neck is already more than twice the length of the body. I say ‘already’ because there is pretty good evidence that the cervical vertebrae grew proportionally longer over the course of ontogeny in at least some sauropods (Wedel et al. 2000:368-369). The neck is 336 cm long, and the femora are 69 cm long. If we isometrically scaled this animal up to have a 2-meter femur, the neck would be 10 meters long, without any such ontogenetic telescoping of the vertebrae. The implications of this for possible neck lengths in the supergiant titanosaurs are pretty darned interesting. The vertebrae of Rapetosaurus don’t really look anything like those of Argentinosaurus. Nevertheless, a sauropod with an Argentinosaurus-sized femur (2.5 meters for the largest known) and Rapetosaurus proportions would have a 12-meter neck–again, that’s assuming this very young Rapetosaurus already has adult proportions, when in fact it may be ontogenetically short-necked (now there’s a thought). In Apatosaurus and Camarasaurus, the cervicals grew in proportional length (i.e., relative to diameter) by 30-50% over ontogeny, but that’s starting from tiny baby vertebrae. The Rapetosaurus vertebrae are already very long, proportionally, but it is interesting to consider the possibilities that they might have been even longer in adults, and that that scaling might have been shared with other titanosaurs. The tail in this mount is oddly short. Only about every third vertebra is real, with the rest sculpted, so the tail length inevitably depends on how many intermediary vertebrae were added. But unless there are a LOT of missing vertebrae, it’s probably not far off. I can tell you that when I first saw the mount I looked at the tail and said, “No way”. But up close, seeing the real vertebrae and the interspersed intermediates, it looked pretty reasonable, in part because the individual caudal vertebrae are proportionally short. This is one of those things where we may just have to wait for more and better material–although that might be a long wait, because this skeleton is already freakin’ gorgeous. For someone who is used to dealing with hideously incomplete and groadily distorted fossils, this Rapetosaurus material is just mouth-wateringly beautiful. There’s loads more weird stuff to talk about, like how the cervical vertebrae are taller than the dorsals, which is opposite the condition in every other sauropod I’ve gotten to look at, and the shape of the ilium, and the conformation of the rib cage, but those will all have to wait for future posts. This one is already much longer than I intended it to be (standard). For the curious, here are all of my measurements. Neck length, dorsal length, etc. are lengths of those sections of the column as mounted–that is, including both the vertebrae and the spaces between them. I haven’t compared any of these to the published measurements, these are straight from the tape measure to my notebook to you. I’m giving them in mm, because that’s what I naturally think in, but they’re all rounded to the nearest cm because given my methods–hand-holding a physical tape measure up next to a bone while I crouch contorted under a fragile mounted skeleton–giving measurements to the nearest mm would be illusory precision. 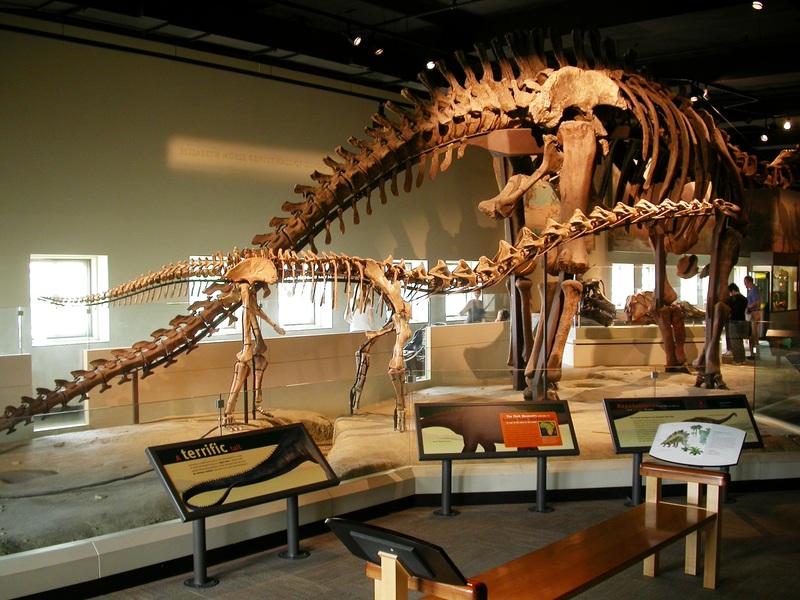 This is valuable because AFAIK this specimen is the only mounted titanosaur in North America, and maybe the only one outside of South America and China. There is at least one mounted titanosaur in Europe – an Opisthocoelicaudia skeleton in Museum of Evolution, Polish Academy of Sciences in Warsaw. I hope you took tons of photographs, not only detail shots but totals, too? From many different angles? Perhaps this is already what Heinrich was alluding to, but did you take enough photos to do some sweet photogrammetry? Wow, that tail is really, really weird. Do sauropod tails get proportionately longer with growth, like necks? Arf, yes, of course–how stupid of me to have forgotten that one! I will update the post accordingly. :-) That one I don’t feel bad about skipping. I think it’s great that it exists, but the art-to-science ratio is too high for me to regard it as an object of study. did you take enough photos to do some sweet photogrammetry? No, sorry, it never crossed my mind. I’ll have to remember that for next time. Do sauropod tails get proportionately longer with growth, like necks? Fantastic question. I would expect so, especially for anything with a whip-tail, but I don’t know of any published data on it. You might be the first person to ask that particular question. Maybe someone else knows and will tell us? As a minor pedantic point, the holotype of Rapetosaurus krausei is not a FMNH specimen, but cataloged as UA 8698 (University of Antananarivo, Madagascar). All holotypes from the Stony Brook / UA expeditions are accessioned at and returned to UA, and FMNH PR 2209 is “only” a referred specimen. Thanks, Andy. Wish I would have checked on that before I posted! "Groadily" – now there's a word Douglas Adams would be proud of. I hope it comes into general usage! Hope he hasn’t become a Valley Girl. Thanks for the link – I’d never heard the term before, but once again Youtube and Urban Dictionary to the rescue!